What breed do you think he is? He's a rescue dog. We know he is a hunting breed mix. He is very tall, muscley and long back legs. It looks like it has labrador retreiver, the muscular build, hard to guess, maybe Amstaff or some boxer breed. Your dog looks just like Lacey, my son-in-laws dog. Lacey is a Chocolate German Short-Hair Retreiver and Lab mix. Your dog and Lacey could pass for identical twins! Yes, tall with long muscular legs and boundless energy! Pretty sure I see chocolate lab in him, maybe also some greyhound? He looks a lot like our red bone hound dog and if he's a hunting dog mix I would bet there is some hound in him. Long, well-muscled legs, boundless energy, floppy ears, and different vocalization for every mood. I was also thinking a lab/greyhound mix. Although there could be great dane in there too. Does anyone else see pointer? I for one, see a lot of pointer maybe pointer/lab/great dane mix? Razorcakes your darling is a brown lab. Yes to bird dog but very smart in blood trailing deer too when trained. Always mild tempered loves children good breed. 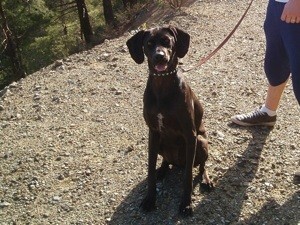 German short haired pointer mix gets my vote also.